By David Lublin and Adam Pagnucco. Folks, this is an unusual joint post from the two of us. David and Adam both live in District 18 and we’ve seen a lot of action here over the last few cycles, so we decided to write this one together. Each of our remarks are labeled so you know who is saying what. We begin by printing the June financial summary and the endorsements below. We include the Senate candidates in that data but today’s post is on the House race. Update: The original totals we reported for Emily Shetty were incorrrect. The correct ones are below. District 18 is blessed with eight (count ‘em!) candidates for the three delegate seats. How is the race shaping up as we head into Election Day? Helga Luest created one of the real moments of the campaign when she attacked Del. Jeff Waldstreicher, a candidate for Senate, as sexist for trying to recruit her into the Senate race. Her “low carb” campaign is catchy but makes me think about the Atkins Diet rather than carbon emissions and the environment. Regardless, Helga is not likely to come in the money because she just hasn’t raised enough of it to engage in sufficient voter contact. Ron Franks has run an earnest campaign and made a positive impression on voters who have met or seen him but faces the same fundamental problem. Like Helga, Ron has raised less than $15K, which is just not enough to win. That leaves six other candidates, including incumbent Del. Al Carr. (Disclosure: I am supporting Al.) Maryland Matters sees Al as highly vulnerable, pointing to his past victories as part of a slate and that he has raised less money than several other aggressive, hungry candidates. I see it differently. Though he has less money, he has raised just a hair under $100K, plenty of money for a delegate race and well over the threshold needed for sufficient voter contact. A former municipal official, Al has cultivated a network of support among local municipal, civic and environmental activists. This is Al’s fourth time on the ballot with two previous victories under his belt, so he has greater name recognition. I also note that Al has managed to do just fine even when opposed by the Washington Post and the Post isn’t making endorsements this year. Finally, he has far more endorsements than the other candidates. In a crowded race, he has consistent support. I agree with David that Helga Luest and Ron Franks don’t have the resources to compete. I think Al Carr will probably win but I am less confident of that than David. In 2010 and 2014, Al ran as part of a united slate of incumbents headed by Senator Rich Madaleno. (I was the slate Treasurer from 2008 through 2012.) In the one race that he ran by himself – 2006 – he finished seventh of eight. Times are different now because Al is the only incumbent running for one of three seats. That’s a huge advantage. But the Delegate field is very strong this year with several well-financed and hungry new candidates. I think Al will win but if he doesn’t I won’t be shocked. Emily Shetty came in a strong fourth in 2014 and worked very hard to maintain visibility since the last election. She was a leader in the D18 Democratic Caucus and now on MCDCC as a gender-balance appointee. She has raised more than last time, though less than anyone besides Luest or Franks, and doesn’t face a slate of incumbents. Emily has tried to position herself as left wing and a new mom, succeeding better at the latter. Word on the street is that Emily has been working very hard at the doors and run a good, focused campaign. Though she missed out on the Apple Ballot, Emily has secured a number of nice endorsements, partly because organizations perceive her as a likely winner. The one major downside: she was endorsed by the Washington Post last time and used the endorsement well to close strong. She won’t have that advantage this time. By all rights, Leslie Milano ought to be out of the mix. She entered the race late, has fewer endorsements and has raised less money than all but Shetty, Franks and Luest. Nevertheless, Leslie has managed to make herself a strong contender. Though still relatively young, she is a bit older than several candidates and has made a consistent impression as someone with a real edge in terms of experience and maturity. Combined with authenticity, she strikes many voters as trustworthy and with the potential to be a strong delegate. At least in my area, she has sent out unusually strong neighbor letters with grassroots support. Still, she is making up ground. I like Emily and Leslie very much. Emily should be a model for politicians who lose their first race. The temptation is to say, “Never again!” and go back to a sane life. That’s totally understandable! But Emily decided to stay involved, joining the Central Committee and working with both Action Committee for Transit and the Wheaton Hills Civic Association. She has many more relationships now than when she first ran and is a stronger candidate. I think she will win. Leslie is one of my favorite new candidates in the entire county. She is a very smart, charismatic and experienced person who is also a hard worker and a good listener. Most of my friends in the D18 activist community love her to death. She’s also versatile. If you’re a progressive, you will love her work to pressure sweatshops to clean up their acts earlier in her career. If you’re more of a moderate, you will love her emphasis on jobs and the economy. But as David noted, she got in late and that hurt her ability to garner institutional endorsements. If Leslie doesn’t win this time, I would like to see her come back and try again. Jared Solomon is a young teacher and I hear repeated whispers from many that he’s extremely nice and seems on track to win one of the delegate seats. While his fundraising is lower than some at $93K, it is certainly well above the threshold for a strong campaign and Jared has run a very hard, engaging campaign. Among the non-incumbents, only Emily can go toe-to-toe in endorsements and he is on the Apple Ballot. If this election were about signs and money, Joel Rubin would win a walk. In the Town of Chevy Chase, where he won election to the Town Council in 2017, I see about twenty of his signs as I walk into Bethesda. At $152K, he has also raised more money than anyone else in the field. As my mailbox indicates, he is closing with a lot of mail. A former political appointee in the State Department, Joel has real communication skills and a lot of foreign policy experience. Joel sought the Democratic nomination for Congress in 2016. In terms of votes, it didn’t go well but he acquitted himself well and it turns out his donors were still ready to help fund his state legislative campaign just two years later. This previous campaign expanded his name recognition but his emphasis on national politics, including in some campaign videos, and running for offices at different levels of government, may not play well with all voters. On the other hand, his videos about his family are among the best and a great, authentic American story. He’s on the Apple Ballot but has few other endorsements from groups. Mila Johns has made a real presence on social media. She speaks her mind both on Facebook and in forums, coming across as an opinionated, honest, straight shooter – welcome characteristics in an age where people are tired of canned politicians. At the same time, though social media is important, nothing beats meeting voters and our Facebook circles are often tighter loops than we realize. Mila is also just a bit behind Joel in terms of having raised money and started sending mail out earlier than other candidates (i.e. before we started getting ten pieces a day). Like Leslie, she could use a few more endorsements but has accomplished the difficult feat of standing out in a crowded field in a very busy election year. Jared is one of the strongest candidates in the race. He has done everything right – he’s on more doors than an encyclopedia salesman, he makes a great impression, he has raised decent money and he has a bunch of endorsements. He is also the only candidate who has ever mailed me a personal, handwritten thank you letter after a round of drinks. I love old school manners like that! Mila and Joel are good candidates who have enough money and support to be in the mix too. Overall, this field is outstanding and is a result of the electoral spigot finally opening after three straight terms of the same four incumbents. I wouldn’t trade our House candidates with any other district in the state. I expect Emily, Jared and Al to win with Leslie having a chance to break through and Mila and Joel also getting big shares of votes. This is a great field of candidates and District 18 is guaranteed to have turnover in at least one-half of its state legislative delegation. The newbies may be in office a long time, so make your choices thoughtfully. 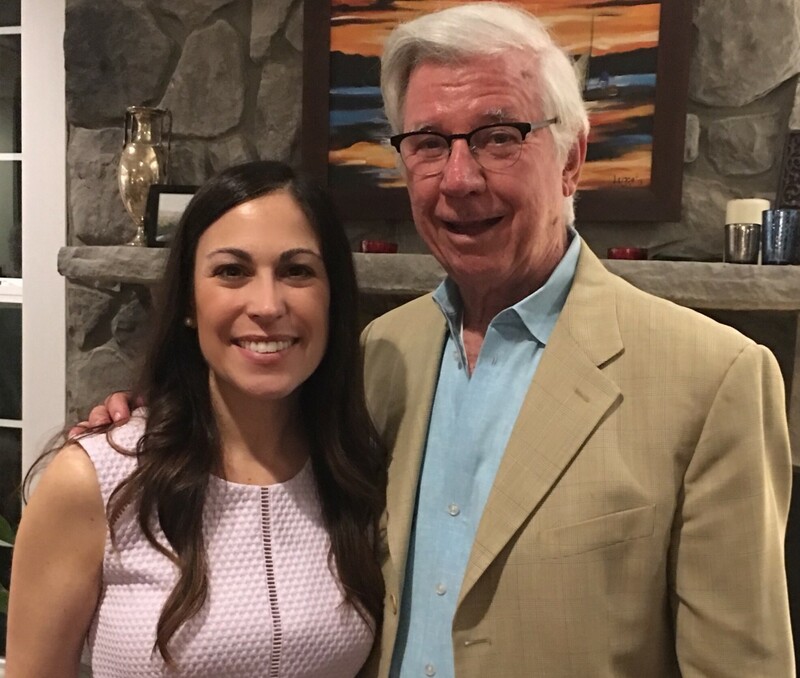 Former Governor Parris Glendening has endorsed District 18 House candidate Leslie Milano. We reprint her press release below. 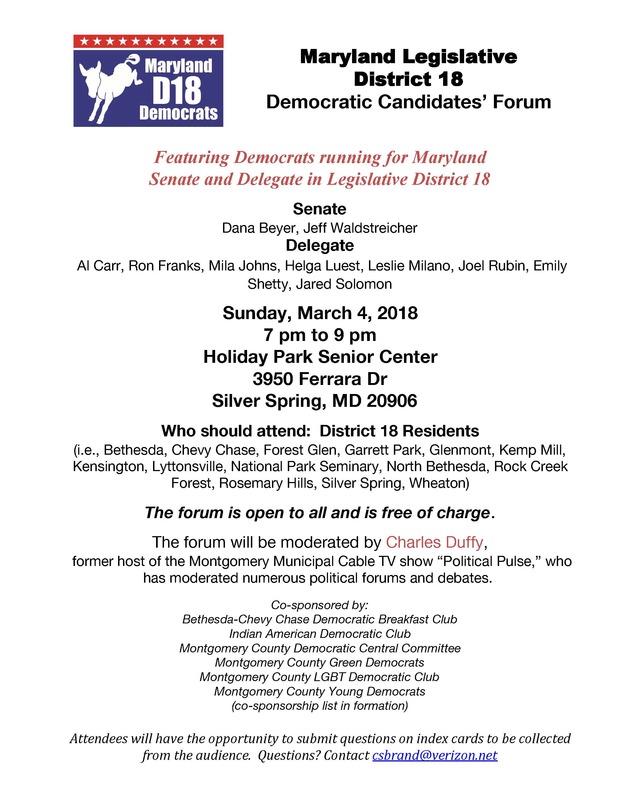 (Silver Spring, Md., April 14, 2018) – Former Maryland Governor Parris Glendening endorsed Leslie Milano for the House of Delegates, District 18 today. Milano—a respected public health executive, human rights advocate, and mother of two—is running on a platform of socially-responsible economic growth, expanding the renewable energy sector, and addressing school overcrowding for Marylanders. Glendening served as the Governor of Maryland from 1995-2003, and was previously the County Executive of Prince George’s County from 1982-1994. At the age of 25, Milano co-founded a nonprofit labor rights organization dedicated to improving conditions for factory workers abroad. She gave lectures on 300 college campuses and business schools focused on corporate social responsibility, and helped to end certain labor abuses affecting hundreds of thousands of women workers. For the past six years, Milano has been the executive director of a public health consulting organization dedicated to patient safety. She has negotiated multi-million-dollar contracts with state and federal agencies to successfully reduce healthcare-associated infections in U.S. hospitals and nursing homes. Milano has also received the candidate distinction from Moms Demand Action for Gun Sense in America, a leading gun violence prevention organization. Milano holds two master’s degrees in Theology/Ethics from Union Theological Seminary and International Public Policy from Johns Hopkins University, as well as a certificate of leadership from Harvard University’s Kennedy School of Government. For more information about Leslie Milano, visit www.milanofordelegate.com. Currently eight Democratic candidates are running for three seats. The primary is June 26, and early voting starts June 14. Last night, your scribe attended and live tweeted the District 18 state legislative debate sponsored by the District 18 Democratic Caucus. Though policy differences continue to be somewhat hard to find, voters could still glean much from what was said–and not said–as well as about the style and experience of the candidates. Dana Beyer possesses limitless self-confidence often associated with doctors. At one point, she tried to tell Moderator Charles Duffy how to conduct the debate. Highly intelligent, her most thoughtful response was about how the General Assembly’s first priority ought to be to undergird the healthcare system against federal attacks. Towards the end of the debate, Dana declared that there is almost no policy diversity among the candidates, so voters need to elect someone who can bring the delegation together and lead. Unfortunately, she has a well-earned reputation of not working well with others. While Dana gave voters a real opportunity to learn her views on a range of issues, Jeff Waldstreicher was reticent to the point of not speaking for the first 75 minutes. Loathe to say anything divisive, Jeff passed on opportunities to outline his views on issues such as liquor decontrol or single-payer healthcare. Jeff finally spoke up to tout past and expected gun control legislation. A classic example of what political scientists call “credit claiming,” he steered clear of the more divisive issue of armed guards in schools. Complimenting Del. Al Carr’s work effusively, Jeff wooed his support. Jeff’s strategy is seemingly to avoid alienating any voters and run a focused “positive campaign” that ignores his challengers. This was my first view of Michelle Carhart, the owner of a local chain of children’s gyms who jumped into the race at the last moment. Much less the pol than her two opponents, she came to the debate with the perspective of a local business owner who sees a need for both less bureaucracy and progressive change. She complained about property taxes, and favors training over handouts as more useful and less demeaning. She argued that everyone should have to pay something for healthcare, so they’d have some skin in the game. Michelle has a lot to learn about public policy but could appeal to people looking for an ordinary citizen rather than a more practiced politician. Incumbent Del. Al Carr (who I support) demonstrated his comfortable policy knowledge on a number of issues and self-deprecatingly to laughter from the audience asked voters to send him as a “grizzled veteran” back to Annapolis after complimenting the strengths of the other candidates. He continues to emphasize the environment and climate change as a critical issue. Since her respectable loss four-years ago in the primary, Emily Shetty has worked hard to position herself for this race by chairing the D18 Caucus and serving on the central committee. Among the most eloquent candidates, she advocated firmly for single-payer health care and is able to discuss the subject more fluently than many experienced legislators. One of my favorite moments was when Ron Franks argued against the prevailing wisdom on police officers in schools. Making the case for people with diverse experiences by applying his own, he made a good argument that police officers serve as valuable role models and revealed a willingness to dissent thoughtfully. Mila Johns stood out as someone unafraid to say what she thinks. In particular, when other candidates held back initially, she stated that the county should gradually get out of the liquor business because it’s killing off restaurants. She also advocated for making it easier for seniors to age in their own homes and death with dignity. Joel Rubin highlighted his experience as an elected local official and seasoned policy advocate who has the communication skills and knowledge to fight for progressive ideals. Living with his mother-in-law (lovely woman, I’ve met her), he argued for incentives for multi-generational housing as one component to addressing senior living. Helga Luest did not reprise her accusations against Jeff Waldstreicher at the debate. Speaking as the survivor of a murder attempt, she argued passionately for a trauma-centered approach and greater community connectivity to help address issues from kids prone to gun violence to isolated seniors. She believes a delegate should engage on leadership at the community level as well as outside the general assembly. Jared Solomon’s answers gave the impression of someone who has studied the issues hard and would listen well but advocate forcefully. Labor should appreciate his advocacy of labor agreements as part of business incentive packages. He said education was his #1 priority. I hope higher pay for college professors is included! Among the more knowledgeable candidates, Leslie Milano stood out as someone who would consistently advocate for economic growth. She referred to Amazon and Marriott tax incentives as normal business practices, which struck me less as politics as usual than someone who was being honest about the way the world works. General similarities notwithstanding—everyone is anti-gun, pro-choice and wants to fight climate change—there was daylight between the candidates on a number of questions. While Leslie Milano expressed support for incentives to attract Amazon, Al Carr advocated investing in education and infrastructure that benefit all businesses. Emily Shetty wanted transparent negotiations, which was very popular, albeit wholly unrealistic. Dana Beyer said attracting Amazon is more important than keeping Marriott. Jeff Waldstreicher expressed no opinion. Mila Johns, Ron Franks, Dana Beyer and Leslie Milano expressed support for getting the county out of the liquor business. I’d also like to know the opinion of other candidates. In the most depressing part of the debate, Joel Rubin said he was okay with armed security guards if schools need them. Helga Luest highlighted the need for risk and threat assessment. Mila Johns and Leslie Milano opposed them with Leslie mentioning their impact on the culture of schools and suggesting bulletproof pods as an alternative. Candidates and the moderator referred to his posts here on Seventh State repeatedly with admiration. While you’re waiting for the Italian election returns to come in (OK, while I’m waiting for the Italian returns. . .), you can tune in to tonight’s state legislative debate @theseventhstate. I believe just filed State Senate Candidate Michelle Carhart will also be there. Delegate Jeff Waldstreicher has posted a strong financial performance in his run to succeed Senator Rich Madaleno. He has raised more money over the cycle and has more cash on hand than any other state legislator in the county. But Dana Beyer has spent nearly a half million dollars of her own money in her three prior races and could spend a whole lot more. Beyer told Bethesda Magazine “she does not plan to self-finance this year’s Senate bid” but still gave her campaign $109,100. While Waldstreicher’s cash on hand advantage is substantial, Beyer could erase it with one check. The recent endorsement by SEIU Local 500 of Beyer may have a big impact on this race. 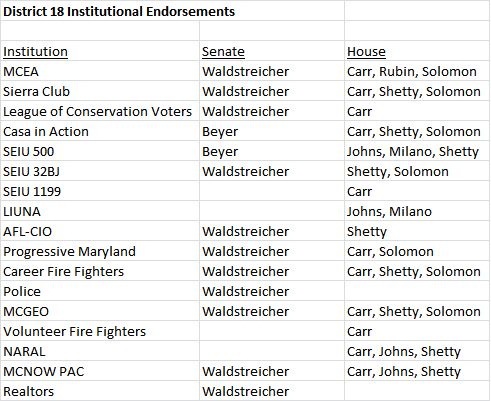 Prior to that, Waldstreicher could make the case to other progressive endorsing organizations that as a three-term incumbent running against someone who was for 0-3 in elections (two running against him) that he would have a big edge and was the safe pick. But SEIU is a huge player and brings credibility to Beyer’s run. Now the endorsing groups may be more likely to evaluate the two against each other on a level playing field and see Beyer as a true alternative. Our prediction is that this will not be the last significant endorsement that Beyer receives. The Delegate race is just as interesting. Incumbent Al Carr had the most raised over the cycle but also has a huge burn rate (81%). He trails Mila Johns and Jared Solomon in cash on hand. Johns leads in cash position (boosted by her $100,000 loan to her campaign) while Solomon led the non-incumbents in fundraising from others ($42,011). Emily Shetty has been a prominent local player since her fourth place finish last time, joining the county’s Democratic Central Committee and doing work with Action Committee for Transit and her former civic association. But she doesn’t want to trail in money behind Carr, Johns and Solomon to the extent she is now. Town of Chevy Chase Council Member Joel Rubin’s cash balance is deceptively low since he began campaigning in November and raised $269,845 in his 2016 run for Congress. Leslie Milano created her campaign account too late to file a January report but says she plans to raise $150,000. Helga Luest was also a late starter. Normally, the only incumbent in a race like this – in this case, it’s Carr – would be favored for reelection. But the challengers are a pack of hungry wolves and Carr is going to have to work to keep his seat. 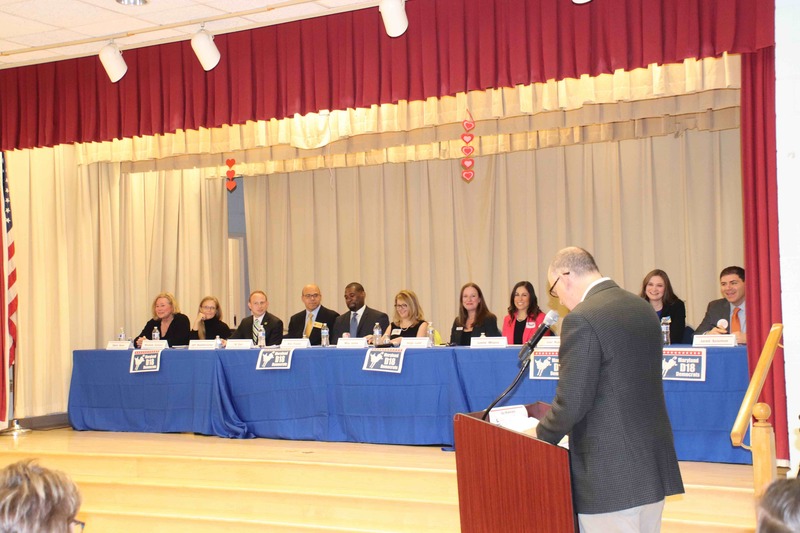 The Big Question: will there be competing slates in this district? Both Beyer and Waldstreicher have money, which is much needed by all the House candidates. Our prediction is that any move to set up a slate by either Beyer or Waldstreicher will provoke the other side to unify too. Competing slates aligned with contested Senate races were common in District 18 decades ago and another one could really scramble this election. The Other Big Question: will Delegate Ana Sol Gutierrez stay in the Council District 1 race, where she has not qualified for public matching funds and ranks a distant fifth in cash on hand, or will she return to the District 18 House race? With the departure of Senator Roger Manno, who is running for Congress in District 6, Delegate Ben Kramer will become the next Senator and the dominant politician in the district. Kramer, who was first elected to the House in 2006, is known for his work on senior issues and public safety, and has been a true hero in his efforts to crack down on drunk driving. He has an absolute lockdown on Leisure World and Kemp Mill, two vital power centers in the district. Kramer is not universally beloved, but he is well respected and no other politicians will mess with him. In politics, that is enough! The two incumbent Delegates, Bonnie Cullison and Marice Morales, will sweep virtually all the progressive endorsements and be reelected. As for the seat being vacated by Kramer, the simple view is that former Raskin campaign aide Vaughn Stewart, who totally smoked the field (including the incumbents) in fundraising, will win it. But the race may not be that simple. MCDCC Member and labor attorney Marlin Jenkins did reasonably well in fundraising and should get a lot of labor support. And attorney Charlotte Crutchfield, who barely lost to Morales for the open House seat in 2014, is running again. Crutchfield is not a strong fundraiser, having collected just $11,960 from others last time while self-financing $44,149. But she has a long history in the district and Kramer formed a slate with her in 2014. Manno endorsed Morales, his former legislative aide, and Morales won by 382 votes. Crutchfield filed an affidavit as her January report but her new campaign has just started. The Big Question: will Kramer team up with Crutchfield again? And if he does, will Cullison and Morales also join in?